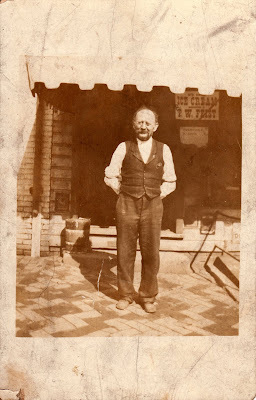 I never tire of my great-grandfather, Henry C. Meinzen, because the more I learn, the more I realize what a character he was. However, he pushes me to frustration for the lack of evidence I find concerning his life before arriving in the United States. A character? Perhaps more like a rascal. He is one of the first ancestors I researched. After spending years trying to find as much information as I could, I was still unable to find his place of birth or his parents. I laid the search to rest. But periodically, I pick up the hunt again, hoping that some new record set will help me locate his immigration information, his place of birth, his parents' names, anything else that will help me go back to his beginnings. Lest anyone think I haven't searched deeply enough, I offer the results of searches with records and sources noted. If you have additional suggestions of where I might look to find more information, I'd be grateful to know. There is a Graves Registration Card for Henry C. Meinzen. It indicates that he served in the Civil War from August 11, 1862 to August 10, 1863, in the U.S. Navy as a Seaman on the ships "Cairo" and "Brilliant." All information on the card corresponds correctly to known information about Henry but I have been unable to locate any information about him serving in the Civil War. If this information were true, it indicates that he arrived in the U.S. four years earlier than he states on his naturalization record. 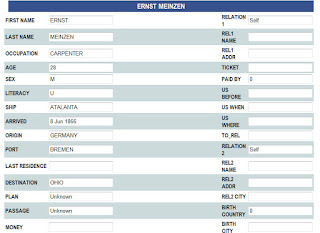 There is an immigration record at the Castle Garden website for Ernst Meinzen with information that corresponds to Henry's information -- all except the first name. The age, arrival date, and destination could all be Henry's information. 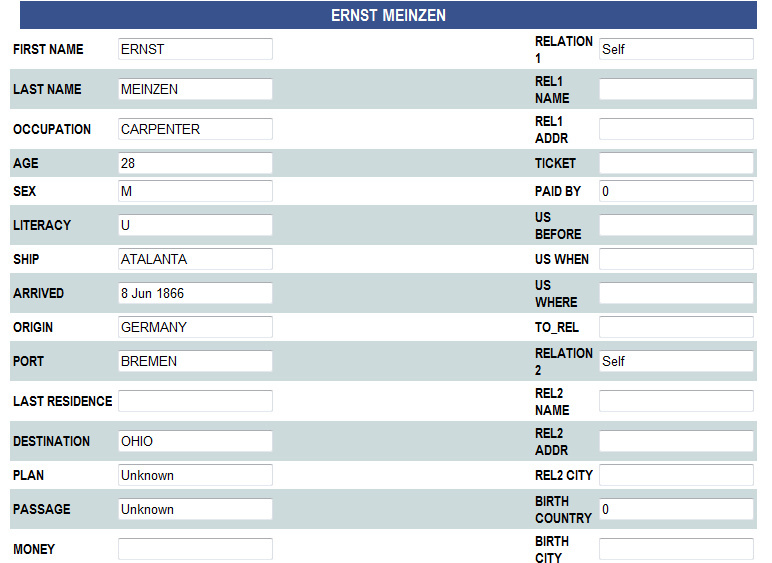 I've found no immigration record for Henry or Heinrich Meinzen. I continue to wonder if they could be the same man. I've not found an Ernst Meinzen in Ohio. Did Henry change his name or decide to use a name other than the one he used in Hannover? A new start with a new name? The location of his birth more nearly than Germany, Prussia, or Hannover. I need a town, city, or village to find further useful information. I have no idea where else to look. His father's name is indicated as Carl on his death certificate but his mother's name eludes me. She is apparently an unknown to both him and his children. 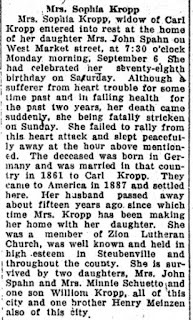 On a side note, I discovered that Henry's sister, Sophia Meinzen Kropp, arrived in the U.S. in 1887, along with her husband and several children, and settled in Steubenville, Ohio. 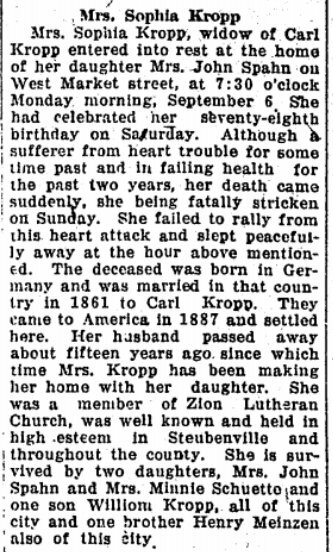 Unfortunately, neither her death certificate nor obituary mention her mother's name. Sadly, her death certificate tells me that her father's name is Deidrick Meinzen. Of course, it's possible that it was Carl Deidrick or Deidrick Carl, or that the informant for the death certificate misunderstood the question, but there's no way to know until I find further information. Those German naming traditions! I have a cousin who has researched this Meinzen side of the family. He's interested in sharing his information but from what I can tell no sources or documentation are included. I'm of the opinion that family history without sources and documentation is family fable. Henry Meinzen and information about him and his life have been easy to find in the U.S. Information about his origins and his parents -- not so easy. That rascal! What a challenge he's been. This is a post written for Amy Johnson Crow's 2019 version of 52 Ancestors. The post topic for the week was "Challenge." Henry is a challenge. Have you tried Archion.de? It's a German subscription site. Or perhaps a German American Facebook group could giv eyou more suggestions. Thank you for the suggestion of Archion.de, Linda. I think I visited the site but decided not to subscribe. I should visit again and reconsider. A German-American Facebook group is great idea. Thanks! Look at that face! How could he be a rascal? That’s a sweet and kind face. He looks like someone who would keep candy nearby for little kids. Well, you know, Wendy, rascals have to have sweet faces to get by with all the trouble they make, right? I do believe he was a kind and generous man and, no doubt, did give out candy. He owned a confectionery for a while so candy was easily available. But he could have left a little more information for his descendants! Your great grandfather sounds like a wonderful character and a challenge to research. You have uncovered lots! Great blog post. Thank you, Colleen. I think he sounds like an interesting character who I'd love to meet. I'd like to hear the pitch of his voice and enjoy his German accent (which I'm sure he took with him throughout his life).